Is arsenic poisoning a problem only of the poor? Did the Roman Emperor Nero really use arsenic to remove a rival to the throne? Did Napoleon die of stomach cancer or was he poisoned as a prisoner at Elba? All sorts of fascinating aspects -- from hard facts and horrifying figures to improbable myths and delightful illustrations to verses from Canterbury Tales--wend their way into Andrew Meharg's well-researched treatise on arsenic. Meharg, professor of biogeochemistry at the University of Aberdeen, uk, has studied the impact of environmental pollutants, especially arsenic on plants, animals and humans. Venomous Earth provides a wealth of intricate details on arsenic contamination across the world. Weaving together an eclectic mix of history, politics, chemistry, biology and geology, this highly readable account of a mass poison, used on the largest scale in the world, delineates the route whereby exposure to arsenic via contaminated water leads to lethal diseases like cancer. The Verdant Assassin One of the many fascinating side lanes the book journeys through is about the medicinal (quack) use of arsenic and its gradual convergence with its infamous associations with poisoning. As many as five chapters explore a range of historical themes: from its uses, as in the production of high-quality bronzes, to the abuses associated with it. From the myths -- could arsenic be transmuted into a precious metal -- to its medicinal applications. All of this is beguiling for the ardent arsenic hunter, but for those seeking information solely on its role in water contamination, the book may seem to be sidetracking relevant issues, despite the holistic perspective it offers. Unlike most other literature on the subject, Venomous Earth is notable for delving into the history of arsenic poisoning. In the first chapter itself, Meharg gives an elaborate description of how the first case of arsenic poisoning was detected by a doctor from Kolkata. Incredibly, arsenic standards were first set in 1900 in the city of Manchester, uk, when contaminated sugar was used in brewing. The resulting beer, which contained 15,000 parts per billion (ppb) of arsenic, ended up poisoning 6,000 people. An enquiry found that a safe acute dose of arsenic beer was 1,000 ppb, but arbitrarily decided that dividing this number by 20 should give a sufficient margin of safety (50 ppb). Such a repository of facts is important for experts and policy-makers, as the underlying politics of arsenic mitigation policies is based on 'what is the safe limit of exposure'. Ready to be put under a scanner by those who expound theories of how arsenic leaches into groundwater, Venomous Earth astutely pieces together the conflicting hypotheses. A pertinent question -- why is it that delta aquifers high in arsenic have not been identified before-- is raised whenever a new arsenic- affected area is discovered. Venomous Earth provides answers. Meharg's observations are not mere rhetoric, but backed by newspaper citings and peer-reviewed research, simplified for neophytes. Several tricky issues also find their way in. One of these is that arsenic affects not just underdeveloped nations, but even a country like the us, despite its formidable notions of healthcare! The current official safety level of the us is 10 parts per billion ppb, but 12 per cent of us drinking water supplies exceed this level, perhaps due to administrative unscrupulousness. Such as Bush's attempt to stall the 10 ppb limit, designed to please mining lobbies that supported his presidential campaigns, despite mining causing major arsenic pollution in the us. Arsenic affects millions Despite the diverse range of his exposition, Mehrag returns to the pervasive nature of a tragedy that has only recently entered public discourse. "Not a single year passes without millions more being added to the list of potential victims." The numbers are a pointer to the international community's general indifference to the menace of arsenic poisoning, despite millions being at risk. Meharg's own anger is palpable as he addresses the nature of the arsenic threat, expressing it in names ranging from the 'Verdant Assassin' to the Devil's Water'. The book unravels scientific issues behind the human tragedy while retaining accessibility to the average reader. 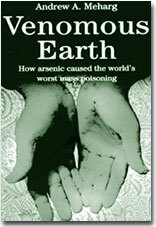 It belongs on the bookshelves of any person wanting to help those affected by arsenic.